'Paper Towns' John Green Cameo Could Have Been Great, So Why Didn't It Make The Final Cut? 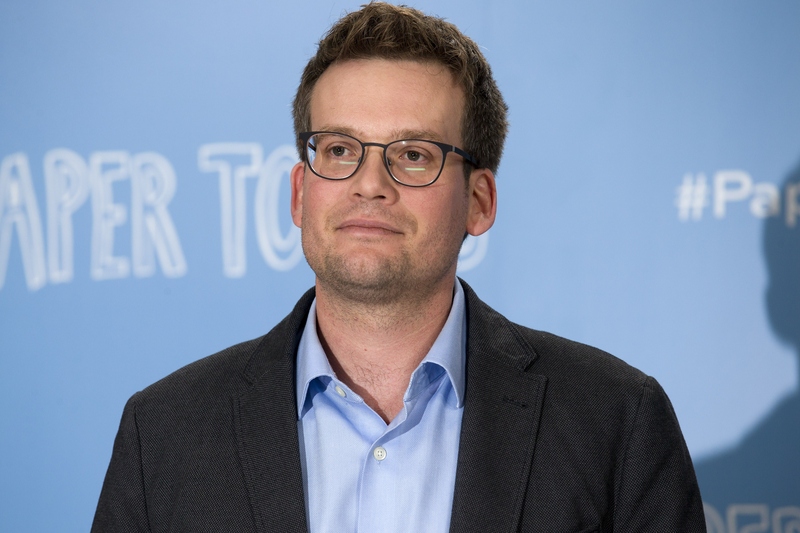 Author John Green has been telling everyone who will listen about his cameo in Paper Towns , the new movie based on his book of the same name. A couple of months ago at Book Con, Green spoke about filming his scene in the movie, describing going through several takes before the director declared one of them "usable," prompting Green to joke, "Daniel Day Lewis tried to give me a method acting tutorial and I got really deep into my character and I gave a ‘usable’ performance." He also told a fan on Tumblr that he does appear in the version of the film that he saw, but admitted that it could get cut before the film makes it to theaters. If the John Green Paper Towns cameo was indeed taken out, it would mark the second time in as many tries that he's failed to make it on screen. His cameo in last year's The Fault in Our Stars famously ended up on the cutting room floor, and doing it again to the guy just seems cruel. So, well, where is it? The Twilight series author appeared in both Twilight and Breaking Dawn: Part 1. She even made it into the trailer for the latter, popping up at the 56-second mark as a wedding guest on the left wearing a purple dress. Gruen showed up briefly in the film adaptation of her novel Water For Elephants, so maybe John Green just needs to start casting Robert Pattinson in his movies if he wants his cameos to survive. Or maybe it's Kristen Stewart who's the key? Anderson is the hand serving a young Stewart mashed potatoes in the movie version of her book, Speak. The author ironically shows up in Something Borrowed reading her own book and also in the sequel to the film, Something Blue. The author of The Help appeared in the movie sporting what is easily the best hairdo on this list. Before Shia LaBeouf went cray, he was in the kid's movie Holes. So was the book's author, playing Mr. Collingwood, aka the guy looking to grow some hair in this clip. Benchley is the author of Jaws, and he also co-wrote the screenplay. Not content with staying behind the scenes though, Benchley appeared in the blockbuster as a TV reporter. The Mortal Instruments: City of Bones didn't pan out to be the next YA sensation at the box office, but series author Clare had a blast filming her cameo in the film, as she discusses in the above clip. Yes, I'm aware that Steve Martin is a movie star, but he's also an author. He wrote the book Shopgirl, adapted it into a screenplay, and then cast himself in the lead role. Take note, John Green, sometimes if you want something done you've got to do it yourself. By far the most-adapted author on this list, King has had over 50 movies made based on his work and over two dozen TV series, and he's appeared in a ton of them. His most significant role was in Creepshow, and you can see him show off his sweet acting skills opposite a meteor. The king of the cameo, 92-year-old Stan Lee has shown up in so many Marvel movies based on characters he's co-created that I've lost track. At this point he's even showing up in movies whose characters' creation he had nothing to do with, like Deadpool . Check out some of his greatest hits in the above compilation. Sorry, John Green, that you didn't make the cut — maybe Looking for Alaska will prove third time's the charm?